Summers in the High Country of North Carolina truly feel like no other. Spring rains create gorgeous, green rolling hills and colorful blossoms just about everywhere one looks. The Carolina blue skies and warm weather beckons you outdoors to enjoy the natural amenities the area has to offer. The autumn leaves are an incredible array of red and gold, while the snow covered winters are beautiful and inviting for outdoor winter activities like skiing and snow tubing. Whether you are looking to lay down roots in the High Country-Avery County region or buy a summer home, the friendly and experienced folks at Antler Realty have the technology, marketing, and resources to find you your future mountain abode! Call (828) 898-3111 or email today to start your search for Seven Devils homes for sale. Bear Paw State Natural Area is a 148-acre attraction inside Town limits. Visit the Otter Falls Trails on the weekend, featuring miles of hiking through the cool mountain forest. An observation platform near the falls allows for a relaxing view at an elevation of 3,620 feet. 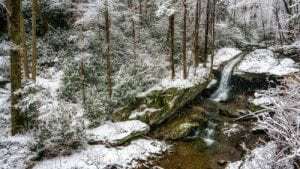 Enjoy a hearty mountain hike and then cool off at Linville Falls, the waterfall with the highest volume of any waterfall on the Northern Edge of the Blue Ridge Mountains. Experience the gorgeous geology of stalactites and stalagmites at Linville Caverns, just south of Linville Falls. The Blue Ridge Mountains in Avery County / Seven Devils has fun for the whole family! Hawksnest offers snow tubing in the winter, holding the title of the largest snow tubing park in North Carolina! Four different areas ensure that snow tubers of all experience levels have a blast. In the summer, zip-line on one of the nation’s longest lines. Watch your family enjoy the zip-line throughout the mountains on the huge observation deck! Life in the High Country offers all types of fun, outdoor mountain recreation. Let the folks at Antler Realty guide you through finding the best deals on Seven Devils homes for sale so that you can always be within easy distance of awesome High Country mountain amenities! Does your family like to read? Visit the Seven Devils Book Exchange! You can borrow as many books as you would like, as the Book Exchange runs on the honor system. Just please be sure to return them when you are finished! Visit the Seven Devils Town Hall for reading opportunities for all ages. If you have fallen in love with the peaceful community of Seven Devils, trust the folks from Antler Realty to help you find the best deals among Seven Devils homes for sale. You visited the area and loved it… is it time to stay?